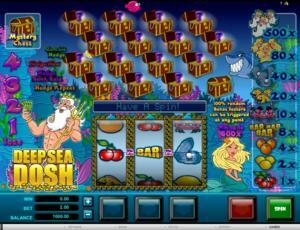 Deep Sea Dosh is a colorful and merry online video slot game from Microgaming that has been released in June 2009. This online video slot machine game has 3 reels and 1 pay line. The Deep Sea Dosh has an underwater theme with sunken treasure chests filled with gold, heavily guarded by a nasty shark. You are given an odd mission by the Roman god of the sea, Neptune, to retrieve the treasure chest in exchange for his daughter’s hand in marriage and more gold treasure that you can ever dream of! Considered to be one of the most specially-made slots games which resemble a pub slot more than a video slot game, Deep Sea Dosh is a very entertaining slot game to play at, most especially when they have included Nudge, Shifta and Hold features, which sets this one apart from other 3-reel classic slots. Most Microgaming online slot games are available in 2 formats. The first format is the one preferred by most players, which is the download format. The second format is the Flash or browser-based version, which means there is no need to download anything at all. Whether you like to download or not, Microgaming has slot games for all your slot gaming needs. Deep Sea Dosh is available for instant play only, so you no longer have to download anything. Give Deep Sea Dosh a spin and you will surely see why this classic online slots theme has been and will always be a favorite type of theme for many players who love to play online slots! A favorite among many slots players online, Deep Sea Dosh presents a typical underwater, sunken treasure theme but with entertaining online slots action for all Microgaming players! When you first play the game, you will see a sunken chest filled with gold at the bottom of the sea, wherein a shark is intently guarding it for no reason at all! Neptune, the Roman god of the sea, challenges you to retrieve the treasure chest, and in return you can win up to a 600x multiplier on your total bet in the Take It or Leave It Bonus Game, plus his daughter’s hand in marriage! Take a deep breath, dive into the vast sea and fish your fortune with the Deep Sea Dosh online slot game, which offers features such as the Hold Feature, Nudge Feature, Nudge Bank Held Feature, Nudge Repeat Feature, Nudge Gamble Feature, Shifta Feature, Let’em Spin Feature, Take It or Leave It Bonus Game, and the maximum cash jackpot you can win is $5,000! The quality of the graphics and sound provided by Microgaming software is without doubt outstanding. They possess an impeccable track record of making the most impressive graphics and realistic sound effects. A lot of online slot players love Microgaming because its online slot games have smooth animation and remarkable yet non-intrusive background music and sound effects. The slot game looks a lot like a typical pub slot or fruit machine game than a video slot game, but most players don’t mind much whatever it is, because for them it truly is a very exciting slot game for something that has only 3 reels and 1 pay line! The background of the reels shows the deep blue realm of Neptune, the Roman god of the sea. You are given an odd mission by Neptune to retrieve the treasure chest that is being heavily guarded by a nasty shark, and in return you get to win the hand of Neptune’s daughter as well as the treasure chest! The reels are positioned on the bottom center of the game screen to perfectly align with the Nudge/Hold buttons. It Cod Be You!, Piece of Skate, Play Your Carps Right, Prawn in the USA, Happy as Scampi, etc. are some of the clever remarks used in the digital display window. The payout list is shown on the right side of the reels. The overall graphic design of Deep Sea Dosh displays colors that you can normally see in the sea such as blue and green. Other colors used in this game are gold, brown, purple, red, orange, pink, black and white. When you are playing Deep Sea Dosh, there will be no constant background music that you will hear. When you spin the reels, bubbly water sounds will be heard. If you manage to get winning combinations, arcade game sound effects will be heard. When you get Nudges, cheerful water-themed music will be played out. You will hear the powerful voice of Neptune saying “Shifta!” or “Nudge Bank Held” whenever you manage to trigger those features. There are no regular card deck symbols available in the Deep Sea Dosh online video slot game. The symbols that you will find in the Deep Sea Dosh slot game are the Cherry, Lemon, Orange, Bar, Crab, Fish, Shell, Mermaid, and King Neptune symbols. There is no Scatter Symbol in the Deep Sea Dosh online slot game. What made Microgaming’s Deep Sea Dosh pretty popular unlike other 3-reel, 1-pay line slot machine games is that it has great features and an exciting bonus feature game! It has many cool features (Hold, Nudge, Nudge Bank Held, Nudge Repeat, Nudge Gamble, Shifta, Let’em Spin) as well as a fun and exciting Take It or Leave It Bonus Feature game wherein you can win up to a 600x multiplier on your bet amount! The Hold Feature in the Deep Sea Dosh online slot game occurs randomly and its function is to hold the position of 1 or more reels for the next spin. When the Hold Feature is active, you will see the “Hold” buttons displayed just beneath each of the 3 reels. The Nudge Feature in the Deep Sea Dosh online slot game occurs randomly and its function is to allow you to bump a reel to display the next symbol. You can win up to 4 nudges per spin. The Nudge Bank Held Feature in the Deep Sea Dosh online slot game occurs randomly and its function is to bank your awarded reel nudges. You can win up to 4 reel nudges each spin. The amount of nudges rewarded to you is highlighted, and the Nudge buttons are enabled. The Nudge Repeat Feature in the Deep Sea Dosh online slot game occurs randomly and its function is that you can win the same amount of nudges used in your last spin. In the Deep Sea Dosh online slot game, it has a Nudge Gamble Feature wherein you can gamble your current nudges in order to win additional nudges. You can win up to 4 extra nudges. Once the Nudge Gamble Feature game is over, you are then automatically taken back to the main Deep Sea Dosh online slot game. The Shifta Feature in the Deep Sea Dosh online slot game is rewarded randomly after a spin that has no winning combination. The Let’em Spin Feature in the Deep Sea Dosh online slot game occurs randomly. If 2 exact same symbols are shown on the pay line after you have used up all of your nudges, the Let’em Spin Feature will activate randomly. Don’t hold any of the reels, and then spin. You are given a winning combination at random. The Take It or Leave It Bonus Feature Game in the Deep Sea Dosh online slot game occurs randomly. In this Bonus Feature game, you can win up to a whopping 600x multiplier on your bet! The game is simple, you decide to either accept or reject the offer by Neptune. There will be 16 treasure chests presented to you. In each treasure chest, there will be a random multiplier amount. In every round, 5 random treasure chests are removed and you are offered a random multiplier amount. If you accept Neptune’s offer, your total bet amount is multiplied by the multiplier amount you’ve accepted. If you reject Neptune’s offer, 5 random treasure chests are removed and you are offered another random multiplier amount. You can keep on rejecting the offers until 1 treasure chest remains. The Mystery Treasure Chest holds a random multiplier amount. You can choose this Mystery Treasure Chest, or the multiplier amount shown in the final treasure chest. Your overall bet amount is multiplied by the multiplier amount you will get. Once the Take It or Leave It Bonus Feature game is over, you will be taken back to the main Deep Sea Dosh online slot game, and your bonus game wins are included to your win total. Deep Sea Dosh has 3 reels where you may bet on 1 pay line. The minimum bet is 0.10 and the maximum bet is 10.00 per line. You can wager 1 coin only per pay line. Thus, the minimum bet amount is 0.10 and the maximum bet amount is 10.00 per spin. The maximum payout in the main Deep Sea Dosh online slot machine game is a 500x bet multiplier value; and up to 600x in the Free Spin Bonus Feature game. Deep Sea Dosh does not have an Autoplay function.